The need for a survey of the "Fairfax Line" originates with a land grant by Charles II in 1649. This paper will discuss several areas to include the original land grant, the rulings of the Privy Council, the actual survey, the present day significance of the survey, and the efforts by Surveyors Historical Society to relocate the beginning point during their "Rendezvous ‘99". The author is a Land Surveyor engaged in private practice in Virginia. He has a specific interest in the Fairfax Line because it forms the North line of his home county. The early development of the Colonies that became the United States of America depended on a great many different acts of man, including surveying the land. From small parcels of land to surveys that helped delineate large grants and political boundaries, the colonial surveyors were in the midst of many great steps of progress enjoyed by our forefathers. One of the more interesting surveys involved the survey of the "Fairfax Line" to establish the limits of the Northern Neck land grant in Virginia. This land grant of approximately 5,000,000 acres was a "political payoff" by a King to his friends and has lead to all sorts of intrigue down to this very day. Politics continued to play a role through the mid 1700's as we shall discover shortly, the Courts of England and the United States had things to say about the matter, and a great deal of the early development of this country took place therein. As a general point of reference for orientation, the Fairfax line runs from a point about 3/4 of the way up the East slope of the Blue Ridge Mountain approximately 30 miles North of Charlottesville, Virginia, in a North-Westerly direction to a tri-county corner point in West Virginia near where the Western panhandle of Maryland dips down into West Virginia. The genesis of the Fairfax Grant is in the year 1649 when the King of England, Charles II, is in exile in France with several of his loyal followers. As a reward to two Culpeper brothers and five other loyal friends, the King issued a grant for a "porcon of Virginia .... bounded by and within the heads of the Rivers Rappahannock and Patawomecke.....". Initially this was pretty much a useless piece of paper since the King was in exile, but Charles II was restored to the throne in 1660 and the grant was recorded and a "proprietary" created in the new world. It is worth noting here that this was taking place within 50 years of the first permanent settlement in the new world and the territory that was ultimately encompassed therein had not been explored and was not known. Ultimately the 7 original shares ended up being held by the 2nd Lord Culpeper and his only child, a daughter named Catherine, who married Thomas 5th Lord Fairfax. Thus the Northern Neck Grant is commonly referred to as the "Fairfax Grant" and the survey that is the focus of this paper is referred to as the survey of the "Fairfax Line". It does pay to marry wealth. Early in the history of this grant, knowing that the boundaries were between two Rivers was adequate for the owners and citizens of the new world, but eventually questions started to arise as to just what were the limits of this massive grant. When one is down near the Chesapeake Bay it is very obvious whether you are between the two Rivers, but as you move upstream every branch of a river raises a question as to which side the boundary follows. There were early opinions that the grant should only go upstream as far as the "falls" past which ships could not sail. Other opinions were suggesting various major forks of the rivers, and, of course, the owners wanted to go all the way to the headspring of each river. But which headspring? If you have ever examined the beginnings of a stream in a mountainous area you are well aware of the fact that many small springs flow together to eventually form a stream which eventually matures into a river. Even after an agreement has been reached as to just how far upriver to go, then the question arises as to how to connect those two limiting points. Is it a straight line? Do you attempt to follow various natural boundaries? Just where do you go? These various questions offered many different options and the parties on different sides of the issue obviously had conflicting interests and goals. Enter politics and the courts. During the early 1700's many different interests came into play regarding the extent of the lands of Lord Fairfax. Obviously Lord Fairfax wanted as much as he could get. The Governor of Virginia wanted him to have as little as possible. At various times Lord Fairfax was astute enough a politician to recognize that if he pushed the issue he would lose. So he delayed. Eventually the matter was going to come to a head and those people that would make the final decision needed some good solid information as to what the fuss was about. Several different things took place in the 1730's that eventually helped resolve the situation. The County Surveyors of the counties that adjoined the Potomac and Rappahannock Rivers were ordered to survey, map, and provide field notes for those portions of the rivers in their counties. In 1736 three different survey expeditions were organized with all three having representatives of the Colony of Virginia and Lord Fairfax. One group was to explore and map the Potomac to its head. A second group was to explore and map the North Branch of the Rappahannock and the final group was to explore and map the South Branch (Rapidan River) of the Rappahannock. All three groups consisted of surveyors and commissioners and their works were completed. The work of the three groups and the county surveyors lead to the preparation of a map of the Northern Neck in the years 1736 and 1737. The map shows the courses of both rivers and of particular interest makes note of Latitudes across the map. The ability and knowledge to relatively easily get an accurate Latitude certainly contributed to the accuracy of the map. The one thing the map does not show, however, is a boundary line across the end of the grant. This was still to be decided. Lord Fairfax was wise enough to know that he did not want a decision made by the Colonial Government because he would surely lose. He played the game of politics very shrewdly and managed to get the case transferred to the Privy Council in London. After managing to choose his time very carefully, when he thought he had a sympathetic Council, Lord Fairfax finally got a ruling that was very much to his liking. The Council ruled that his grant would go from the headspring of the Conway River (on the Rapidan, on the Rappahannock) to the headspring of the Potomac River. This indeed turned out to be a very fortuitous ruling for Lord Fairfax because it gave him maximum land area that he could develop and prosper from until after the Revolution. VI. THE SURVEY OF THE "FAIRFAX LINE"
After the Privy Council had issued its final ruling, the next step was to survey the line connecting the head springs of the two rivers. In 1746 a survey crew was formed consisting of four surveyors, Col. Peter Jefferson (father of Thomas) and Robert Brooke (son of Robert Brooke who was one of the 1736 surveyors exploring the Potomac) represented the Colony and Benjamin Winslow along with Thomas Lewis represented Lord Fairfax. There were also a number of "Gentlemen Commissioners" representing both sides of the matter, and a number of helpers with various other duties. Altogether, the party ultimately consisted of approximately 40 men along with their pack animals, supplies, etc. "The little book in which Lewis wrote with a quill pen, and which easily went in his pocket is 3.5 inches from side to side and 5 5/8 inches from top to bottom ........In spite of his poor spelling, Thomas Lewis was a man of culture and wide information. He had a literary taste, and was probably one of the best mathematicians in the colony....... It is possible that Lewis wrote this journal day by day on the expedition, sometimes making his entries at night by the flickering light of the camp fire. In view of all the conditions we cannot help admiring his straight lines and good penmanship, and we are much disposed to excuse his bad spelling....... We are reminded here again of the fact that only a small part of the story of our country, in the conquest and settlement of the wilderness, has ever been told, and now only a small part can ever be written. It is such documents as Lewis’s journal that now and then give to our imaginations the wings of exalted visions." The journal itself tells a lot about the work and life of the expedition and the characters of the people therein. The next few entries of this paper will be quotes or paraphrases from the journal to give an idea of just what the situation was with the expedition. First, however, a comment or two. It seems that surveyors are not a lot different 250 years later. There appears to be something in the nature of the beast. Another observation is his constant reference to the commissioners as "gentlemen commissioners". One can almost hear the sarcasm in his pen. Since these men might be considered lawyers today, again not much has changed. Now to the journal: Lewis sets out from home near Staunton, Virginia on Wednesday, September 10, 1746, to go to Capt. Downs to await the commissioners and the other members of the expedition. On Thursday he took sick and had to put up for the day and then proceeded on to Capt. Downs the next day. The others were arriving at the same time and he speaks of spending the day very agreeably. On Sunday they solicited a preacher to preach them a sermon before they departed and they were bid farewell. After getting things ready on Monday and Tuesday, they retired to their camp on Tuesday and spent there hours with a great deal of pleasure and merriment. He was taken ill in the night with violent vomiting. On Wednesday they continued packing and spent the evening "in our usual manner". They were alarmed with a quarrel in Capt. Downs lane amongst a crowd of drunken people. The rails and stakes of Capt Downs fence supplied the want of cudgels and they were applied with tolerable good success. On Friday, September 19, 1746, they departed Capt Downs and set off to commence their assigned task. They called at Kirkley’s and regaled themselves with some very good cider. They were obliged to camp before arriving at the head spring of the Conway. On Saturday the 20th, the mountains made such a dismal appearance that John Thomas took sick and returned home. One gets the idea that just getting to the beginning point of the survey was a major task and it probably was. The next task was to find the proper beginning spring that had been identified in the 1736 survey. They spent time measuring up several different forks well up in the Blue Ridge Mountain attempting to compare their survey to the prior survey. They eventually satisfied themselves that they had the correct spring and found some trees that probably had been marked ten years earlier. It appears that they really weren’t fully satisfied that they had the proper location, but finally the "gentlemen commissioners" agreed upon a starting point. One of the things that may have lead to difficulty is to understand a spring in the Blue Ridge Mountains. Typically they are not a "gusher" high up in the mountain, but rather a "seep" and considering that this is mid-September it is very possible that there was little if any water flowing. Finally, on September 25th, they began to run a trial line to connect the headspring of the Rappahannock River with the headspring of the Potomac River. They probably had a copy of the 1736 & 1737 map, but it would serve only as a general guide for their direction and distance. They made their best estimate as to a direction and proceeded to run on a course of N 41 2/3 W off into the Western wilderness of Virginia. They would occasionally run into settlers on the Western frontier, but for all intents and purposes they were on their own for an indeterminate period of time. They were beginning about 3/4 of the way up the east slope of the Blue Ridge and had to then cross the Blue Ridge and several other major valleys and mountains as they would soon find out. After crossing the Blue Ridge and coming to the Shenandoah River in Page Valley, they met up with the rest of their baggage which had been sent there from Capt Downs rather than bring it all over the Blue Ridge with them. They encamped at Loungs and dined and regaled themselves with several black jacks of punch. Through out the journal it is obvious that they never passed up the opportunity to have a good drink. Surveyors never change. On Sunday the 28th at night they took a variation of the needle and found it to be 1.5 degrees West. The four surveyors that were on this journey were probably some of the best the colony had to offer and the survey demonstrates the ability to run a long straight line on a North-West heading, a knowledge of astronomy, and many other aspects of surveying. At this point it was determined that it was not practical to take the horses and baggage over Peaked Mountain so the surveyors struck off on their own while the baggage and "gentlemen commissioners" went around. The day was exceedingly hot, the mountain steep, and they were almost overcome and ready to faint for want of water. They did, however, make it up, across, and down the Mountain in one day all the while running a survey line and measuring the distance. Quite a feat. By Friday, October 3rd, the survey had gone 31 miles and Lewis notes that several of the horses had like been killed tumbling over rocks and precipices and "ourselves often in the outmost danger this tirable place was called Purgatory". By this time they had crossed the Shenandoah Valley and were headed up into the Allegheny Mountains. Many parts of the Allegheny’s are still very rough and rugged to this day and one can only imagine the hardships being faced at this time. Once again the surveyors separated from the main body with a couple of horses while the commissioners and the main part of the baggage went to find an easier way. On Sunday the 5th the surveyors could not "lyeby" because their horses were starving and they only had provisions for the day. Necessity made them press forward. Here Lewis laments the great many hardships being endured by the surveyors and the horses and observes that they were very lucky that no one broke a shin. At one river crossing they decided to leave their work and go downstream to see if they could discover some inhabitants where they might get some provisions. They only discovered one family of "poor Dutch people" from whom they could have no supply. Fortunately Mr. Brooke returned from having found the main party and brought with him enough supplies so that the surveyors could proceed on. On Tuesday the 7th they ascended a very steep mountain and passed mile 46 on their survey. Again the horses were having problems traversing the terrain and there was no water for them. On Wednesday the 8th they broke the glass of their compass. On Wednesday the 9th they encamped opposite Coburns. They "went to see Coburn who with his wife & miller a Bucksom lass Repay’d the Visite in the evening we spent very merily". This was the last settlement they expected to encounter and laid over on the 10th to be supplied with fresh provisions, shoe the horses, and do laundry. The survey continued on October 11th with additional reports of rugged terrain, rough going, success at hunting a bear and three cubs for food, swamps, etc. etc. This was an extremely difficult journey and the men had to know that they would have to do it all again. Never the less, they pressed on because they had a task to finish. On Friday the 17th they started being concerned that possibly they had missed the head of the Potomac and had gone too far. Streams were running in the wrong direction (towards the Mississippi) and I’m sure frustration was catching up. They pressed on, however, and on the 21st one of the men who had been on the 1736 journey reported after an exploration that he had found the headspring of the Potomac from ten years prior with the previously marked trees plainly visible. The rest of that day and the next the surveyors ran a "traverse" from where they were at to the headspring so that they could calculate their error. That night they dined on a loin of roasted venison and drank to his Majesty’s health. After performing their calculations, they discovered that they were only off line by about 4 miles - quite amazing considering that they had run approximately 76 miles on an educated guess. With this information they were able to calculate a corrected bearing for the return trip and on Thursday, October 23rd, they left the head of the Potomac to return to the place of beginning. The return trip was no less difficult, but Lewis’s notes seem to not be as "down" as some of the earlier comments. In fact, on the return trip they had to do additional work of blazing trees and otherwise marking the line the entire way. They also took a couple of occasions to measure up valleys to make a "tie line" to confirm that their return line was running true. In spite of the hardships encountered, there were however moments of levity. Lewis does note that they stopped at Coburns again on the return trip on the 28th where they dined and had wrestling matches. On Thursday the 30th they concluded the evening with "merriment" since it was his Majesty’s birthday, they drank to his health, and discharged 9 guns. Another moment of levity occurred on the 29th when they held a trial for Fumfire the farrier. Several days earlier he had deserted the group, but reappeared to them on the 28th. At the trial it was determined that his punishment would be to wear a bell about his neck for a week. This was probably a serious event and the thought of wearing a bell was indeed a punishment not to be enjoyed, but one can imagine that the trial might have had a good laugh or two as well. One does get the impression throughout the journal that even though the men were serious about a difficult task, they did know how to have a good time. Once again, a sign that surveyors never change. Finally, on November 13th, 1746, the survey arrived back at the point of beginning and found that they had "fell about 100 yard below the place of our beginning". They proceeded to mark a rock "FX" and marked and scribed a number of trees. Thus in a little over one and one-half months, this group of intrepid surveyors surveyed over 160 miles of line (76 mile out, 76 miles back, plus tie lines) and managed to end up within 100 yards of their beginning point using a compass and chain. An amazing accomplishment!!!! They broke camp the next day and all of the men started to proceed home. Jefferson, Winslow, and Lewis set off for Capt Downs and then went to spend an evening with Mr. Madison - one assumes he means the family of James Madison. The leaders of the colony of Virginia, including the surveyors, were an apparently tight knit group and took every opportunity to stay in touch with each other. The surveyors had one more task to perform and that was to prepare a map of the Fairfax lands. They had agreed that they would meet at Jefferson’s on January 1, so Lewis continues in his journal that he departed home on December 30. The schedule did not hold and Lewis did not arrive until January 3rd, but not to worry as Brooke and Winslow had not arrived. After waiting several days and getting tired of the wait, Lewis set off to find the other two. He arrived at Brooke’s on the 15th of January to find him preparing for his journey in a few days. They finally ran across Winslow and agreed that they should leave for Jefferson’s on the 21st - only three weeks late for a meeting to draw maps. They finally arrived at Jefferson’s on the 23rd of January and began work on the 24th. They soon discovered that they needed additional paper and supplies that needed to be ordered from Williamsburg. They continued their work until February 21, 1747, at which time they had completed seven plans of the Northern Neck each about three foot square. He does not say what happened to the seven plans, but one of the original copies is located in the "State Paper Office" in London. In 1860 a hand drawn copy of the original map was made and returned to Virginia where it now resides. Lewis concludes his journal by saying "Having finished a troublesome and difficult affair wherein I have first and last spent 127 days and cash 3 pounds: 3 shillings". He does not say what, if any, his compensation for the job was. VIII. PRESENT DAY SIGNIFICANCE OF THE "FAIRFAX LINE"
The Fairfax Line surveyed in 1746 still has significance to this day. In numerous places it represents private property lines, for a significant portion of its length it represents County lines, and for several miles it represents the state boundary between Virginia and West Virginia. The North-West end theoretically should represent a corner of the State of Maryland, but because of the way the head of the Potomac River bends around it is only a county corner of three West Virginia counties. This issue was only resolved when the Supreme Court ruled against Maryland in determining that Maryland would only go up the Potomac far enough to meet a point where a North line from the Fairfax stone would cross the branch of the Potomac. Without the ruling, the boundary of Maryland did not make any real sense and was indeterminate. The North-West end of the Fairfax line is known to this very day and is easily accessible. In addition to being a tri-county corner, there is a lane that leads right up to a small park and picnic area with appropriate plaques and other identification. The South-East end of the Fairfax line is just the opposite. To my knowledge it has not been used or identified since 1746. It is located in a very remote, wooded area in what is now Shenandoah National Park and can not be located other than in a general sense. 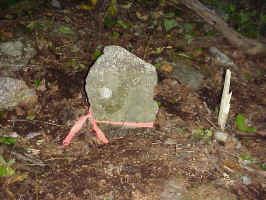 The Surveyors Historical Society will be gathering in Luray, Virginia, September 23 - 25, 1999, to hold "Rendezvous ‘99" for the purpose of reestablishing the beginning point and, with a little luck, perhaps even find the initials "FX" that the surveyors of 1746 chiseled in the rock. Throughout 1999 additional research will take place, known points along the line will be GPS’ed , and at the rendezvous we will attempt to follow in the footsteps of the surveyors from 1746. You are invited to join us. Throughout the year 1999, members of Surveyors Historical Society, numerous volunteers, and friends performed several surveys to help establish and, hopefully, find the South-East end of the Fairfax Line. In the months leading up to the surveys, record research was conducted throughout the counties in Virginia and West Virginia through which the Fairfax Line passes. The purpose of this research was to identify existing monumentation that is supposed to be in the line and exactly where those points are on the ground. I say above that we were looking for points that are "supposed" to be in the line because there are no confirmed marks throughout the length of the line that were left by the surveyors of 250 years ago. There are two trees (one dead) that legend says were trees actually marked by the surveyors, but that is all. After identifying approximately 15 to 20 different monuments or places to locate, survey crews went out on three different occasions to locate these points with GPS (Global Positioning System) equipment. The purpose of this work was twofold. First, to locate the points so that they would point us to the South-East end of the line and, second, to check to see what kind of accuracy the surveyors were able to maintain 250 years ago. At this point, credit must be given to three gentlemen and their firms that donated many hours of time and the use of their GPS equipment. First, Doug Richmond and his firm Geometrics, second, Bill Moore and his firm EVS Associates, and third, Marshall Robinson and his firm Allegheney Surveys. Without them this project could not have reached the conclusions that we were seeking. After collecting the data, the first question that needed to be answered is "what is a straight line". At first blush this may seem like a silly question, but we must remember that we are evaluating data over a line 76 miles long that runs approximately N 45 degrees W. There are two possible scenarios to consider: Are we looking at a "great circle" line or are we looking at a line as part of a rectangular coordinate system. If we were looking at a great circle survey, then geodetic inverses of the latitude / longitude coordinates would give us a straight line. An examination of the data showed this not to be the case. When all the geodetic positions were converted to a rectangular coordinate system, we did find that the points were generally found to be in a straight line. Obviously, the pints would not form a perfect line, but our survey results showed that the points we did locate generally meandered back and forth across the theoretical straight line by a relatively small amount - usually less than 250 feet. This was very encouraging because it meant that the surveyors of yesteryear did an amazingly good job and we definitely had a good enough line to point us in the right direction for searching for the stone we were seeking. A second aspect of the preliminary surveys involved actually running some lines on the ground with compass and chain just as the surveyors had done 250 years ago - as the saying goes, "To follow in the footsteps". In September, 1999, as part of the Surveyors Historical Society Rendezvous '99, a group of 30 or 40 surveyors gathered on the side of the Blue Ridge Mountain to retrace the work recorded by Thomas Lewis in his journal of 1746. In his journal, he made mention of two stream intersections that we can still identify today and then he had a series of bearings and distances from these intersections up to the "head spring" of the Rappahannock River. The surveyors of 1999 spent a day retracing the old survey and found that it lead right up to a spring that we had previously suspected as being the head spring. In fact, after almost a mile of traversing with compass and chain, we came to within 20 or 30 feet of the spring head. With the beginning point of the survey of 1746 now confirmed from both directions, approximately 100 people gathered on the side of the mountain to look for the stone that Lewis mentions in his journal. He says that they "fell about 100 yard below the place of our beginning", which is where we set up our search center - about 100 yards from the spring. We fanned out to from a line that looked like a "crime scene" search and started looking for the stone. After about 30 minutes or so, Rick Casteel from West Virginia yelled out that he had found something. The something found was a stone set vertically that looked like any number of stones that surveyors of today find that have been set as property corners by surveyors of yesteryear. Some people felt they could even see the "F" that Lewis noted they marked on the stone in 1746. One piece of work was yet to come. 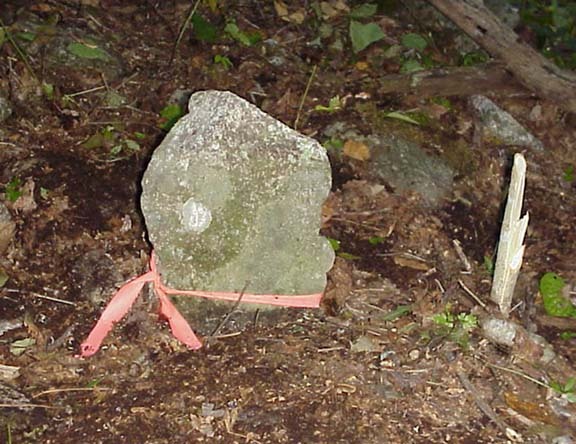 In the Spring of 2000, a group of archeologists from James Madison University excavated the stone to see if there was any buried evidence that would support or disprove this stone as the "Fairfax Stone". Unfortunately, nothing was found. As a personal note for a conclusion, it is the author's opinion that this is the stone that was set 250 years ago. This statement is made with perhaps an 80% level of confidence. As a surveyor, I have seen numerous stones that have been used as a boundary marker and this clearly looks to be such a stone. While absolute certainty will never be achieved, there were no other realistic possibilities discovered to be the stone. I am confident in stating that if this is not the stone, thence the actual stone no longer exists.